Consumer Financial Protection Bureau Director Richard Cordray speaks in March 2015 during a panel discussion in Richmond, Va. Cordray, the first director of the Consumer Financial Protection Bureau, tendered his resignation Nov. 24, and plans to kick off his gubernatorial campaign Tuesday in Grove City. 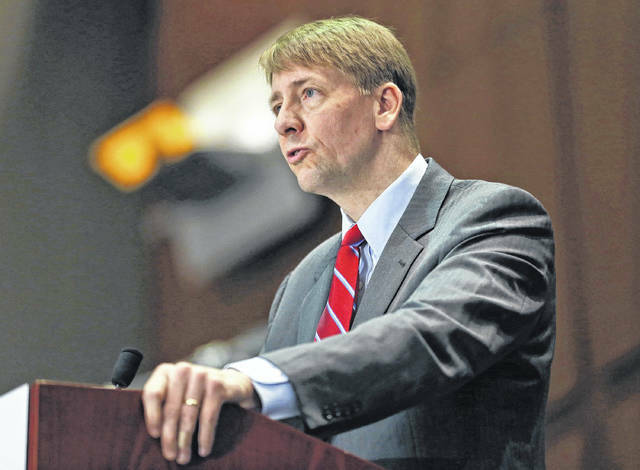 COLUMBUS — Former consumer watchdog Richard Cordray put an end to the suspense Monday, confirming after months of speculation that he plans to make a run for Ohio governor. The Democrat planned to formally launch his campaign Tuesday at a diner in his hometown of Grove City, southwest of Columbus. As he enters the crowded field, the 58-year-old Cordray is viewed as among Democrats’ strongest contenders to seize a critical swing state from Republicans next year. He resigned last month as director of the Consumer Financial Protection Bureau, one of the last major Obama-era holdouts in the Trump administration. He is also a former Ohio attorney general and state treasurer. Cordray is likely to face a bruising battle for the state’s top job. Five Democrats are already in the race and showing little sign of withdrawing. Four of the contenders — former U.S. Rep. Betty Sutton, state Sen. Joe Schiavoni, Dayton Mayor Nan Whaley and former state Rep. Connie Pillich — held their third debate in Cleveland on Monday, a symbol of the months of campaigning already under their belts. Republicans also have been campaigning against Cordray for months, taking to airwaves and social media to criticize his role as head of a consumer agency many in the party view as misguided in its structure and mission. In a hint he enjoys some old-guard support, Cordray named a somewhat overqualified person to keep his campaign’s books: a former treasurer of the United States. Fellow Democrat Mary Ellen Withrow, 87, is a native of Cordray’s home state. The twice-elected state treasurer was nominated as U.S. treasurer by President Bill Clinton. She served from 1994 until 2001. Her name appears on 67 million pieces of U.S. currency totaling $1.1 trillion. In the coming days, he plans to embark on a “kitchen table tour” of the state, where he’ll meet with Democratic activists, community leaders and voters.